Windows Server Operating system is designed to run on servers which operate within a client-server architecture. These servers are usually designed to handle heavy workloads and serve as the backbone of most software operations involved in businesses. Therefore, windows server monitoring is crucial to businesses in order to prevent any loss of service due to performance issues and to maintain the seamless flow of operations. ManageEngine Applications Manager provides an agentless approach to windows service monitoring with its out of the box monitoring capabilities. Ensure that key performance attributes such as CPU, Memory, Disk Utilizations are within permissible usage and applications hosted on these servers always run at peak performance. Applications Manager enables users to maintain an optimal overall health and availability of your Windows server by monitoring all the key windows performance counters including details pertaining to all the windows processes and services running on the system. Applications Manager's windows monitoring capabilities ensure that your server performance issues do not become a cause for business downtime. Tracking CPU and Disk utilizations is very important because they reveal power consumption stats and also play a crucial role in measuring the load and analyzing performance issues. A processor package usually consists of multiple cores with dynamically changing frequencies and shared caches. Applications Manager windows performance monitor extensively shows the CPU utilization with the break up of individual core utilizations and their status. 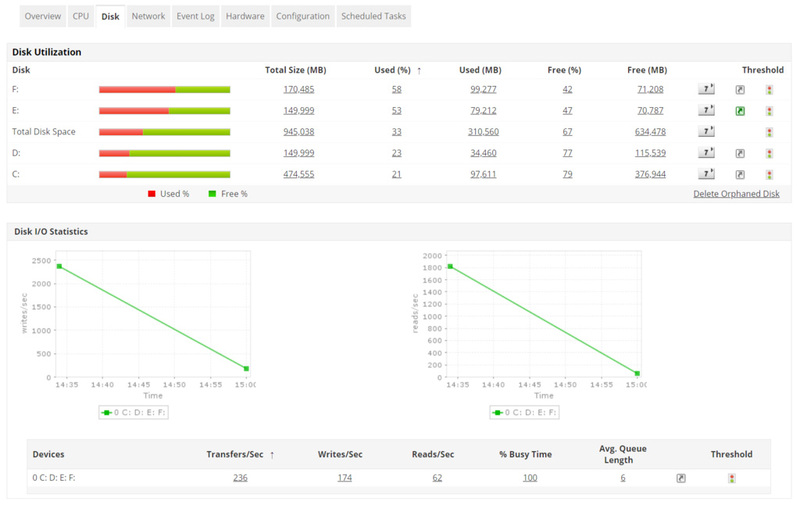 Regulate the disk usage by closely monitoring disk utilization with disk wise break-up and I/O statistics and ensure that performance bottlenecks are nipped in the bud. Applications Manager Windows performance monitor also collects network performance stats such as input traffic, output traffic, network errors , speed, etc. For all round windows performance monitoring, users can also add windows processes, services and scripts to monitor within Applications Manager. See how Applications Manager can meet your Windows monitoring requirements. Schedule a personalised demo. Applications Manager's windows server monitoring capability also extends to monitoring the event logs of your windows server. Monitoring event log data is the most accurate way to detect network anomalies, data breach attempts and tracking network intruders. Configure event log rules and trigger alerts for windows events from application, system, security, file replication service, DNS server and directory service log files. Learn more about Windows Event Log Monitoring. Your windows server might always have numerous tasks configured to run at scheduled times and manually checking the status of important tasks among the crowd could be quite cumbersome. With Applications Manager Windows monitoring software, monitor critical scheduled tasks in your windows server and view task details such as whether the task is enabled or not, last run time, last run result, next run time, missed runs, etc. and make informed decisions. Additionally, you can also add windows services, processes and scripts to monitor with the windows monitoring module. Associate automated actions to be performed based on the order of severity of the tasks to reduce manual intervention for troubleshooting whenever possible. Using Windows monitoring tools provided by Applications Manager, set threshold values for various windows server performance attributes to identify performance bottlenecks. Trigger alarms upon violation of these thresholds and get notified via e-mail or SMS incase it requires immediate attention. Set up automatic windows service actions such as restarting or stopping the server as an instant troubleshooting measure to resolve issues faster and ensure 24/7 windows server monitoring. 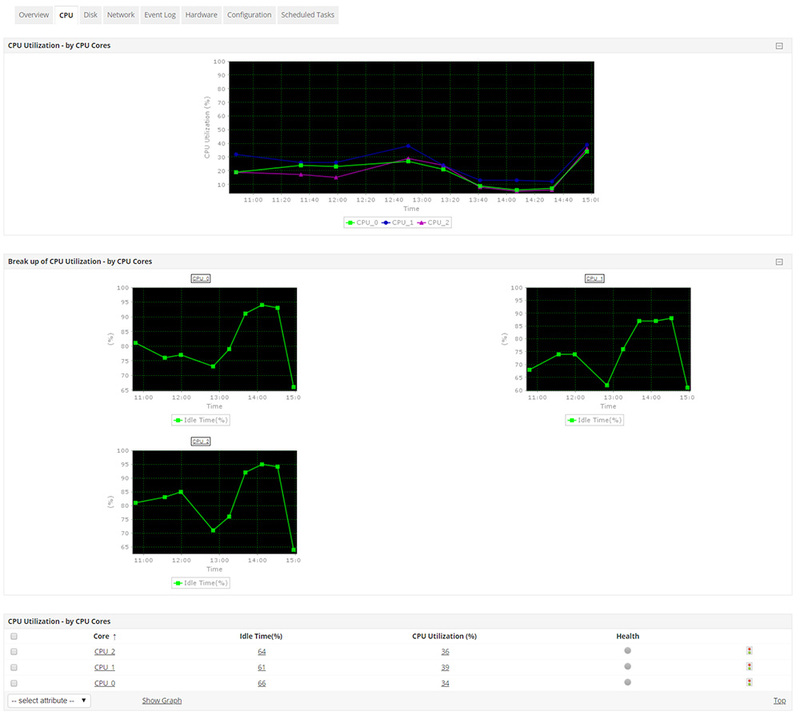 Windows monitoring in Applications Manager allows users to not only analyse and compare the attribute wise historical performance trends of their windows servers but also enables them to forecast the future growth and utilization trends of the server based on machine learning powered analytics. Additionally, the capacity planning reports help admins see which servers are overutilized, which are underutilized or idle and distribute load accordingly in order to prevent a server overload or crash. Applications Manager windows monitoring software proactively monitors details like health of processors, failure of any physical or logical drive, cooling units/fans and current voltage, etc. for hardware servers (HP Proliant and Dell Power Edge) and VMware ESX/ESXi servers, to identify issues caused by a malfunctioning hardware component. Monitoring windows server hardware components such as power supply rating, CPU fan speed, temperature, disk & array, memory, processor, etc. can significantly help reduce performance issues due to hardware anomalies. ManageEngine Applications Manager's Windows server monitoring supports all versions of windows- Windows server 2000, 2003, 2008, 2008 R2, 2012, 2016, 2019, Windows Vista, XP, NT, 7, 8, 10.